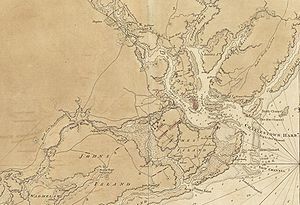 John Murray (Virginia's royal governor) promised freedom to the slaves of American patriots who joins his army on the Chesapeake. American generals Richard Montgomery and Benedict Arnold attack Quebec in attempt to drive British forces from the colony and take on Canadian support for the American cause. However, their attempt failed. This battle happened a few months after the American Revolution started. The British wanted to keep their control over the city and the sea ports. The British decided to take two hills (Bunker and Breeds) in order to have advantage over the Americans. Once the Americans heard about it they went to defend the hills. British land and naval forces attacked the Continental Army on Long Island, leading to a series of American defeats over New York and New Jersey. British and American forces clash near Chadd's Ford, Pennsylvania. Washington's army leaves the field and Howe's force occupies Philadelphia two weeks later. 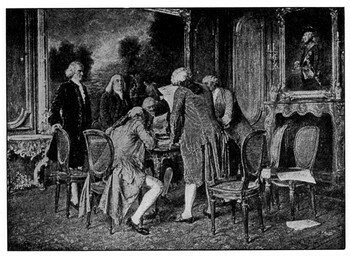 Representatives of the Continental Congress and the French Government sign a treaty of alliance that made commercial exchange easier, provides French recognition of the U.S. and pledges mutual support in the struggle against Great Britain. Native American and Loyalist forces fight a major battle against invading American forces in the territory of the Iroquois Confederacy. Harsh fighting between Loyalist and Backcountry militia ends in death, or capture of an entire Loyalist force. This battle stopped the British invasion of North Carolina. Sir Henry Clinton wanted to get rid of loyalist power and restore British political control on the whole region. It later led to a war across the south. American delegates sign and their British counterparts sign preliminary articles of peace between the United States and Great Britain that recognize American independence. 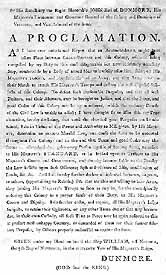 This treaty ended the American Revolutionary War.